It didn’t take the other Numpty long to see that we were dealing with base 13 here. ‘A = 1, B = 2, …, Z = 20,’ he read – well, that’s Base 13. I breathed a despairing sigh. When a putative ORWELL had appeared some time later from the misprints and he informed me that 1984 is B98, my depression grew deeper and he was howling abuse by the time he had explained (or so he thought) that BBC made 2014. Of course, that is the advantage of solving as a team, as his patience rarely lasts to the end of working out the endgame and I was alone with my calculator, checking that I had all the multiples of 13 in the putative shapes – but I am leaping ahead, that was some time later. I know that sadly BeRo is no longer with us but that doesn’t preclude his continue membership of the Listener Setters’ Tipplers’ Club. He never missed the pre-dinner gathering at the annual Listener event (to my mind one of the most enjoyable parts) and he will be with us in spirit for a few years to come and, of course, in his clues: ‘Leader of rioters sloshed beer about Salmond’s drive (7)’ (I wonder whether that is a pre-electoral anti SNP comment!) We worked out that we had BEER* + C + CA’ (Scots) giving us REBECCA. Then there was ‘tipsy cake’, ‘A better British Rail introduces tipsy cake (6)’ BR round CAKE*. Cheers, BeRo! 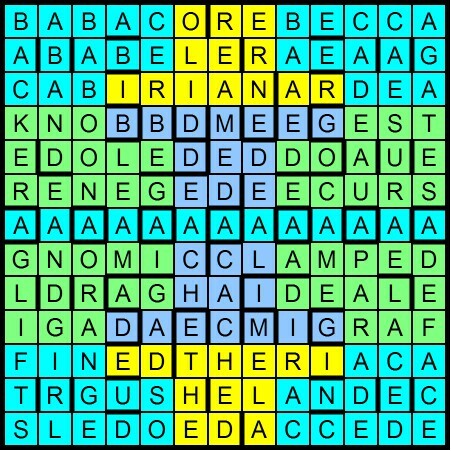 Relatively easy clues so the grid was quickly filled with just a couple of empty cells and the usual couple of doubts. The clashes spelled out ORWELL for us, and that hint in the preamble ‘among whose works is one containing a striking thematic example’ took us straight to 1984 as everybody’s school literature included that fine opening sentence about the clocks striking 13 as Winston Smith emerged from Victory Mansions. So we had the title. Rather pointlessly after we had understood that 48% in a clue actually referred to 60% in base 10 (Note New Hampshire’s latest Government edict, 48 per cent cut refused (7) RE + N + (Hampshir)E + G + ED(ict), I worked my was down the tenth letters of clues, looking for ten significant letters. How deeply ingrained is base 10, even if we think we are not particularly number-minded. Changing that to the thirteenth letter at last took me onto home ground – SIX X NINE ADAMS appeared. I had to check with Mr Math that 42 in base 10 gives 54 in base 13 (well, I suppose I can just about stretch to that!) so we had the answer to everything as the conundrum at the bottom of the grid. http://en.wikipedia.org/wiki/42_%28number%29 and had to enter the anomalous 6 X 9 = 42. We were left with the requirement to complete the central row, which was to be the first of thirteen shapes of equal area into which we were to ‘notionally’ divide the grid, that were to give us an ‘unbroken, multiple, thematic sequence’. This clearly stated that our thirteen shapes needed to be of thirteen cells each and it didn’t take a lot of imagination to realize that if A = 1, the central row was going to be a row of As, adding to 13. 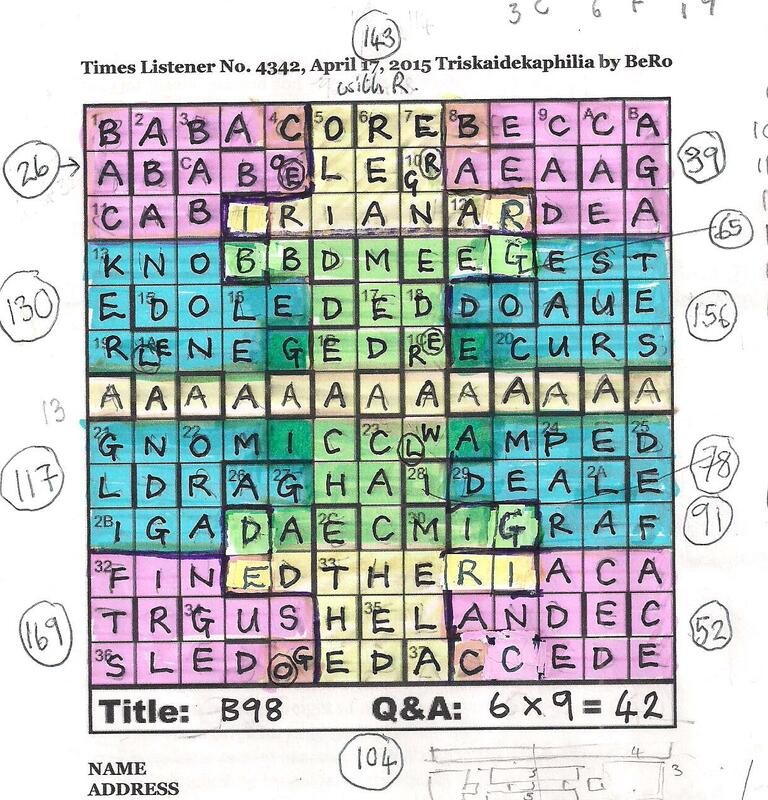 Enough – we got there with a sigh of relief and rather sad reflection that this will probably be the last crossword by BeRo that we’ll solve. I hope he’s somewhere up there enjoying a heavenly Listener tipple and aware of how much solvers appreciated his swansong. This entry was posted on 8 May 2015 at 4:00 pm	and is filed under Solving Blogs. Tagged: Base 13, BeRo, Triskaidelkaphilia. You can follow any responses to this entry through the RSS 2.0 feed. You can leave a response, or trackback from your own site. The hint for 1984 was slightly more explicit than you mention, as it was “numbered” among his works.